Step 1: Replicate the projects until they have the same lifetime; in this case, that would mean buying used cars five consecutive times and new cars four consecutive times. A. Buy a used car every 4 years for 20 years. Maintenance costs: $1000 every year for 20 years Fuel costs: $ 250 every year for 20 years (5000 miles at 5 cents a mile) Step 2: Compute the NPV of each stream. 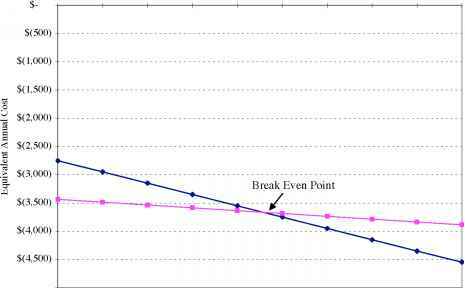 NPV of replicating used cars for 20 years = -22225.61 NPV of replicating new cars for 20 years = -22762.21 The net present value of the costs incurred by buying a used car every 4 years is less negative than the net present value of the costs incurred by buying a new car every 5 years, given that the cars will be driven 5000 miles every year. As the mileage driven increases, however, the relative benefits of owning and driving the more efficient new car will also increase. We can compare projects with different lives by converting their net present values into equivalent annuities. In this method, we convert the net present values into annuities. Since the NPV is annualized, it can be compared legitimately across projects with different lives. The net present value of any project can be converted into an annuity using the following calculation. Equivalent Annuity for 5-year project = $442 * PV(A,12%,5 years) = $ 122.62 Equivalent Annuity for 10-year project = $478 * PV(A,12%,10 years) = $ 84.60 The net present value of the 5-year project is lower than the net present value of the 10-year project, but using equivalent annuities, the 5-year project yields $37.98 more per year than the 10-year project. ^ eqann.xls: This spreadsheet allows you to compare projects with different lives, using the equivalent annuity approach. Based on the equivalent annuities of the two options, buying a used car is more economical than buying a new car. When an investment that costs more initially but is more efficient and economical on an annual basis is compared with a less expensive and less efficient investment, the choice between the two will depend on how much the investments get used. For instance, in illustration 6.4, the less expensive used car is the more economical choice if the mileage driven is less than 5000 miles. The more efficient new car will be the better choice if the car is driven more than 5000 miles. The break-even is the number of miles at which the two alternatives provide the same equivalent annual cost, as is illustrated in Figure 6.6. 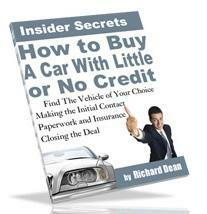 How To Get That Car With Little Or No Credit. Think you can't get a car because you have no credit? You need to read this report today. Are you in need of a car? The cost of a new car nowadays equals about what my parents paid for their first home. It's not a purchase to be taken lightly. You want to do everything possible to ensure you get a great deal.